I figured instead of keeping everyone waiting on pretty after photos of the bookcases I might as well just dive right in. But first lets back up. To paint the bookcases I really only needed to take off what was on the shelves. 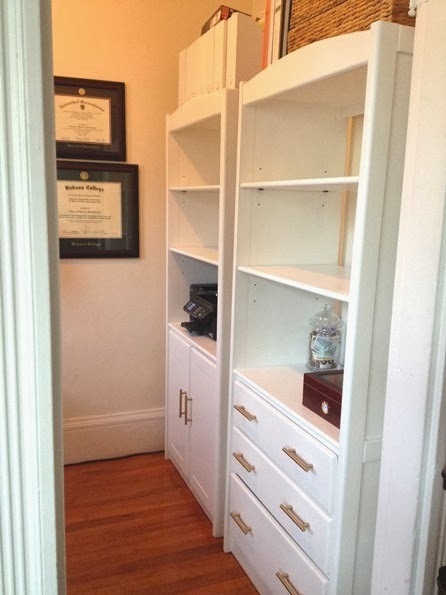 Everything else could stay in the drawers and cabinets. So I took off all the books and piled them neatly in front of my fireplace. Fast forward 3 weeks when the bookcases were ready to be used, I decided it was time to give the office a good cleaning. Yes, this is my husbands 'space', but in my defense this 'space ' is like a black hole of crappola. I was sick of putting his mail neatly on the side of his desk only to find it a week later spilled on the floor, unopened. Nails on a chalkboard I tell you! Just keeping it real here folks! Good design isn't just about the pretty after pictures all the time. There is usually a process in getting there, and here is mine. I labeled bags and sorted for hours. It was liberating! And for the record, he was very appreciative that I took the time to do this because in the long run it will save him HOURS of looking for lost documents. So it was a win-win. And here is what they look like now!! Ahhh, so fresh and so clean! 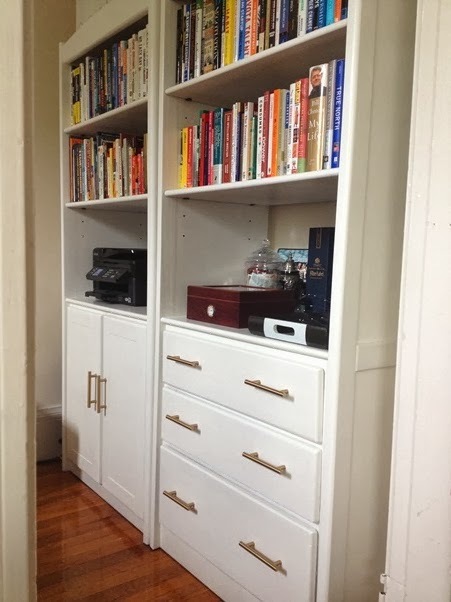 I cant even tell you what a little white paint does for this space. It has completely opened up the office and made it feel so much bigger than it is. 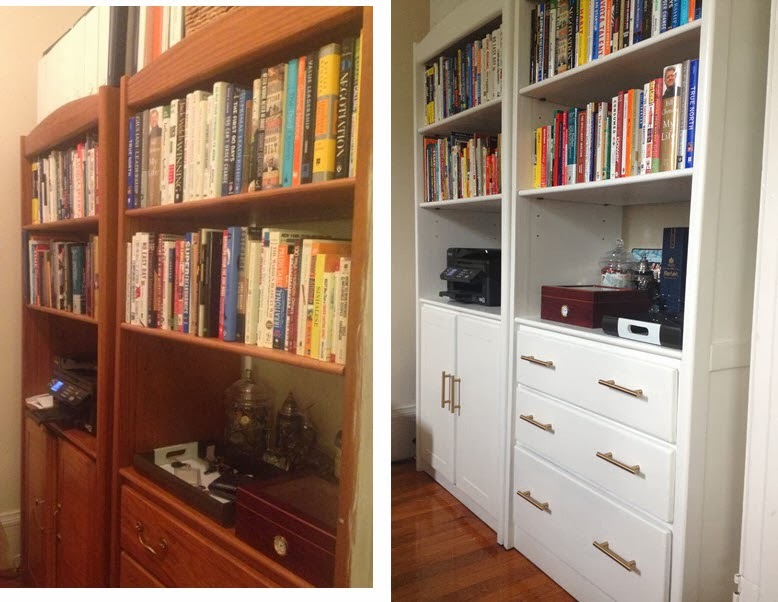 For a pair of bookcases that were headed to the sale pile, I gave them a new life (till I change my mind again). And since everyone loves a side by side- here is the before and after one more time.. I've still got a few more projects for the office to show you, but for now I'm so happy with how they turned out. Now go grab that white paint brush and get to work! What a fab makeover, and the hardware is ON POINT. I feel satisfied just looking those piles. 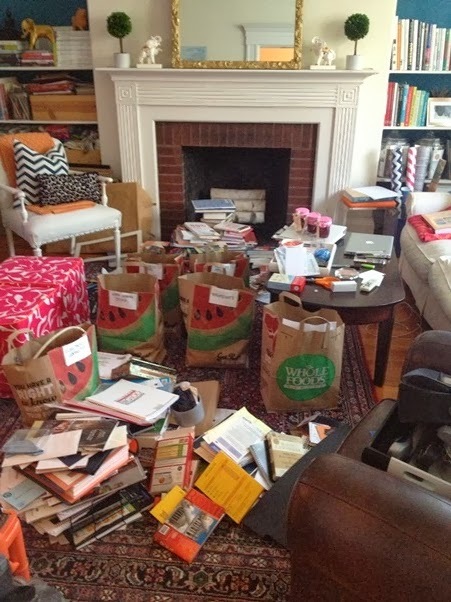 What is it that makes us all so elated with getting on top of clutter? What a huge difference. It was worth all the hard work! Nothing beats a coat of fresh white paint. And that hardware is the perfect choice! There was a saying floating around that white is the new "Botox" for furniture. Great example of paint. What a LOVELY post:) Im now following on pinterest...I hope you follow me back. 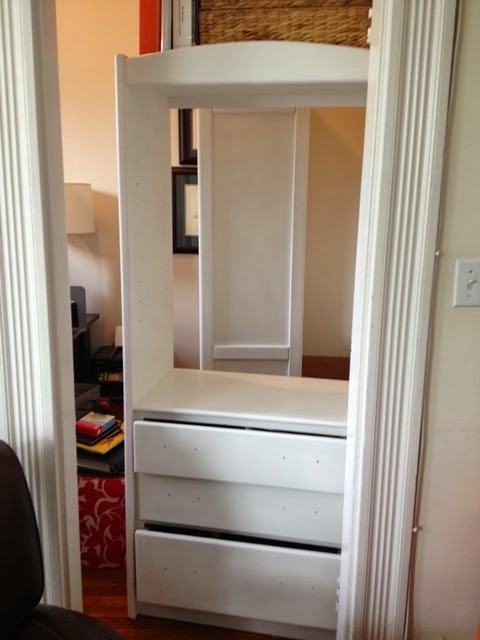 I bet the inside of those drawers must be painted a fun color. So much better in WHITE!!!! LOve it LOve it. It's lovely. Where did you find those pretty drawer pulls? B and Jessica, I got them at Coolknobsandpulls.com- they have a great selection of affordable pulls there!